We will ship it out via FedEx or DHL Express when we run out of Amazon inventory, you can receive this item within 14 days after your order was placed. 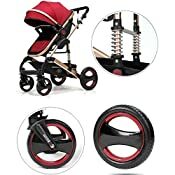 Give your baby a comfortable ride! The baby stroller features a wide seat base and multi-position recline seat. Reclining multi-position backrest with a convenient one-hand recline adjustment, and extendable leg rest make it perfect for infant to use. 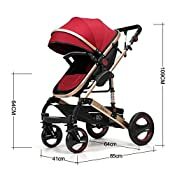 The fully adjustable canopy is designed to protect your baby from harmful sun, and the large storage basket provides a convenient place for your essentials. The color of the actual items may slightly vary from the above images due to different computer setting, and the gifts may slightly change according to the season,thanks for your understanding. 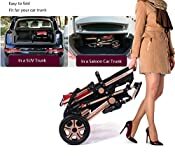 Fast Delivery:We will ship it out via FedEx or DHL Express when we run out of Amazon inventory, you can receive this item within 14 days after your order was placed. 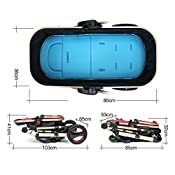 Safety Design : Super natural rubber explosion proof wheels with pedal brake and anti-shock system which will keep your love one sit or lie comfortably.Seats designed with 5-point safety belts. 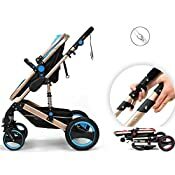 Easy to Fold - Solid steel frame easy to fold,convenient one key to be collected in a car trunk for outdoor activity or on travel.Height Adjustable - Adjustable non-slip handle, you can choose the most comfortable height to push; Adjustable sunvisor ceiling which can be adjusted according to the different weather condition. 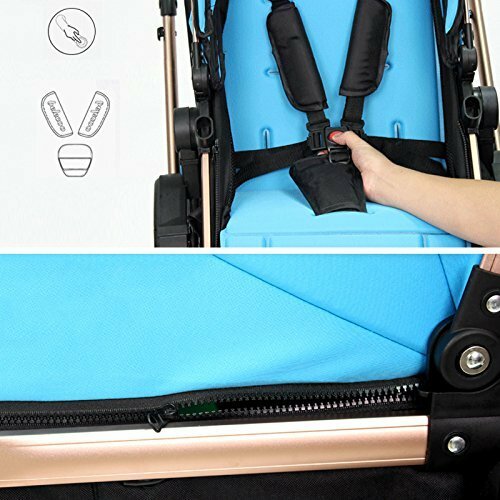 Detachable:The seat is detachable to be used as a bassinet or carrycot, or put a car seat on the frame with an adapter(adapter is not included). Also comes with a big storage basket on the base, which is also detachable for cleaning or machine washing.